Wow, 2015 has been an intense year so far! While we’ve all felt it, our Rescue & Rehabilitation volunteers down in Quincy, MA, have lived it from a unique perspective. Record breaking doesn’t even begin to describe this past turtle stranding season. 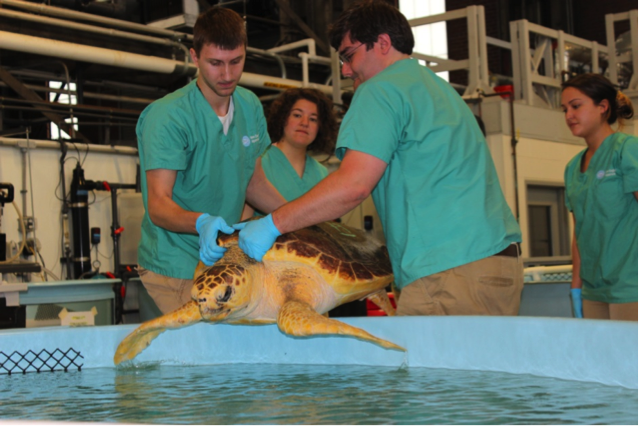 Volunteers gently heft a loggerhead sea turtle into a rehabilitation tank. Specifically during cold-stun events these folks show their unbridled passion. They show up at awful hours and stay until the last piece of equipment is clean--sometimes 16 hours after they started their shift. It is not uncommon for folks to volunteer to do multiple 12-hour days in a week. They do not know when the season is going to start. We certainly never know when it will end. But, the rescue vols are here. In freezing cold rooms, sticking their bare arms in freezing cold water, to support barely live turtles. Cleaning towels, cleaning decks, cleaning filter socks, restraining turtle after turtle. Spending sometimes hours doing food prep. There isn’t much these folks won’t do. All with a smile on their face. Not knowing when it is all going to return to normal! The 2014 sea turtle season began like any other, however it quickly escalated into a serious situation. Hypothermic and debilitated turtles were stranding by the dozens and then by the hundreds; numbers that are unprecedented in our 40+ year history. Volunteers current and past came together to form a well-trained animal care team. Their dedication and long hours, mostly spent wet, permitted us to give the turtles the best care possible. 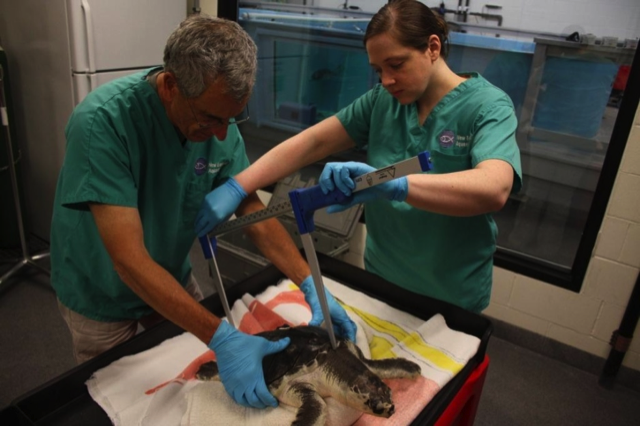 In the end they helped us care for 733 sick or injured turtles, we are deeply grateful for their efforts and dedication to sea turtle conservation and rescue! Could we have gotten through this season without volunteers? The short answer is…no. We have volunteers from many different backgrounds and experiences who come together to help us out in the field, in Quincy and here on Central Wharf. Interested in more information about volunteering? See here!